I have often wondered why the Cauchy rille and fault existed, why there are two nearly parallel features and why they are located where they are. The fact that they are about radial to Imbrium implies that they have something to do with stresses generated by the formation of that basin. But everywhere on the Moon is radial to Imbrium, so the question is why are the Cauchy features here and not elsewhere? Another one of Maurice's grazing illumination (2°) depictions of LRO topo data suggests an explanation. It appears that a gentle rise encompasses the Cauchy linears (outlined on the right). Where gentle doming exists there are additional extensional forces pulling the surface apart. 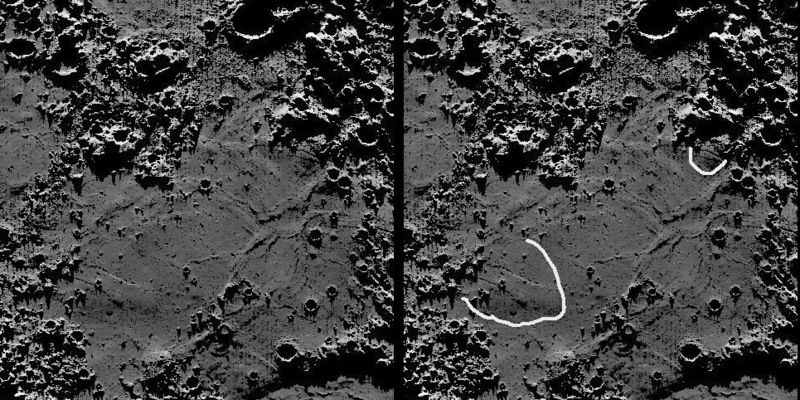 This may account for the location of the rille and fault, with the stresses from Imbrium explaining their orientation. On Earth, rift valleys - trough-like linear depressions between two faults - form on broad domes. I wonder if the Cauchy fault and rille are some perversion of a rift valley? And I bet that the curved ends of both features relate to reaching the edges of the uplift areas, but I am not a structural geologist and don't understand the details. Other localized swelling is associated with rilles - notice the rise at upper right near the Hypatia Rilles. This page was last modified on 13 October 2018, at 18:42.